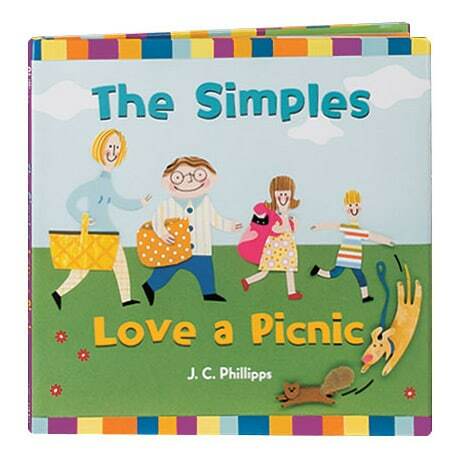 The Simple family—Mom, Dad, Lulu, Ben, and pets Rocco (a dog) and Dizzy (a cat)—are a fun-loving bunch who decide to have a picnic, in this book for readers 4 to 8. "What's a picnic?" asks young Ben. "A picnic is when you pack food in a basket, spread out a blanket, and eat on the ground," Mom answers. But things turn out to be a bit more complicated than that at the park, with incoming soccer balls, busy ants, diving birds, and scampering squirrels—not to mention Dizzy, who will not be left at home. Looks like there's no picnic for the Simples—until Ben has an interesting idea. J.C. Phillipps's paper-collage cartoons and deliberately over-simplified text contrast hilariously with the unfolding disaster.